Random And Some: "We live, as we dream - alone..."
I came across Heart Of Darkness, an 1899 short-story by Polish-born author Joseph Conrad, via the same Radcliffe Publishing Course list that also ranked Their Eyes Were Watching God. Heart Of Darkness served as the basis for Francis Ford Coppola's 1979 epic war film Apocalypse Now. Charles Marlow is a former riverboat captain for an ivory-trading company. 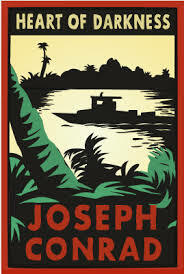 Heart Of Darkness chronicles his journey up the Congo river to meet the reputed and relentless ivory hunter Mr Kurtz. As Marlow and his crew descend deeper into the jungle, they become more detached from civilization, and slowly but surely savagery and racism rear their ugly heads. The relations between Belgium and former colony Congo have interested me since middle school, when our history teacher Jan Leyers educated us at length about the specifics of the annexation. My interest helped me plow through the weighty language, which frankly made the 112-page short-story less digestible than most 400-page books, and the constant ominousness, so if the topic of imperalism does not spark your interest, then Heart Of Darkness is probably not for you.